Viking Books for Young Readers, 9780451469458, 40pp. Julie Falatko loves, loves, loves to talk about books. She has a library science degree, is a frequent contributor to the Nerdy Book Club, was the picture book reviewer for the podcast Brain Burps About Books from 2011 to 2015, and she started a Little Free Library in front of her house to share books with neighbors. Julie lives in Maine with her husband, four children, and big-eared chiweenie dog. Snappsy the Alligator (Did Not Ask to Be in This Book) is her first book. To learn more about Julie, please visit http://juliefalatko.com/ or follow her on Twitter @juliefalatko. Tim Miller is serious about being funny. He studied Cartooning at the School of Visual Arts and now works on picture books that are both playful and absurd. Tim lives in Queens with his cat who did not ask to be mentioned in this bio. To see more of his artwork, please visit timmillerillustration.com. "A charming, irreverent tale for independent-minded tots." "This is the first book for both Falatko and Miller, and it’s an excellent one—Falatko’s writing nimbly zigs and zags around Miller’s bold, goofy cartoons." "More than merely meta, Snappsy is clearly a book, if not a protagonist, with bite." "Falatko’s debut picture book is atruly laugh-out-loud, mischievous romp, made gleefully goofier by Miller’s straight-laced, deadpan animalcharacters." "Filled with exploration-worthy detail… overdocumented youngsters may feel some sympathy for Snappsy, and audiences...will giggle at his battle with the overexcited narrator." "One of the funniest picture books of the year. . . . utterly irresistible." "Falatko’s debut book demonstrates the power of storytelling through words and pictures." "Distinguished by Falatko’s ability to sustain the tension at length; by Miller’s savory palette... and by the unvoiced suggestion that when fiction is working well, a character can take on a life of his or her own." "This one goes to the top of the meta-heap. 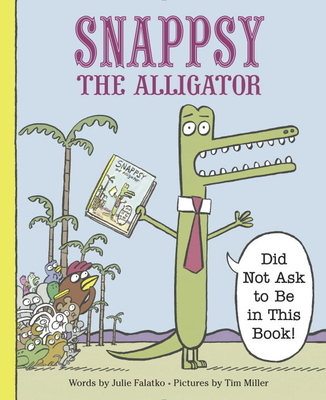 Snappsy the Alligator is a wonderful exploration of subjectivity... and a lot of fun." "If a pesky narrator did THAT to ME, I'D bite 'em right on the—*AHEM* Great job with your creative conflict resolution, Snappsy!" "Adam Rex didn't ask to be on this book either. But despite being a mean man who generally dislikes debut authors he is a fan of Snappsy the Alligator." "Modern storytelling that never compromises, page after hilarious page."